More information: Formed by Ian Faragher and futurist and author Mark Stevenson, the band manages to pen an unashamed love-letter to prog whilst seeking to break new ground, from punk to pop, brass band, electronica and classic rock. Initially conceived as a side-project, blurred beginnings soon sharpened to reveal a clear path towards greater things. Quantum Pig's musical powerhouse is Ian Faragher. Composer, acoustician and multi-instrumentalist, Faragher has played an active part in the UK experimental music scene for over ten years with his 'Sonic Imperfections' concert series and radio show (Resonance FM). Outside of Quantum Pig he performs and releases experimental music with 'The Broca Ensemble' (Champion Version Records), the 'Tonal Liberation Army' and 'The Drone Choir'. Resident philosopher Mark Stevenson has two overlapping lives, one as a writer and musician, the other as a 'reluctant futurist'. As one of the world's most respected thinkers on the interplay of technology and society, he spends a large part of his life exploring the cutting edge. He's also the author of two best-selling books. With Quantum Pig’s combined cultural and philosophical influences, it should come as no surprise that their debut album is equipped with a stark, relevant and thought-provoking message. “To paraphrase Abraham Lincoln, this is a record that is about disenthralling ourselves from the dogmas of the past so that we can think and act anew,” says Mark Stevenson, the band’s principal lyricist. 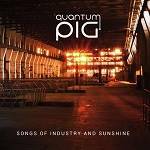 Having featured on Quantum Pig’s first slice from their upcoming album, prog-drummer du jour Craig Blundell (Steven Wilson, Frost*) returns on record to further lend his talents to the impressive artistry housed within ‘Songs of Industry and Sunshine’. White Star Records co-owner and in-house producer John Mitchell (It Bites, Lonely Robot, Frost*) also completes his hand in Quantum Pig’s debut release with a “full house” of production skill lent to the album, praising its “plethora of hooks and cracking choruses”.